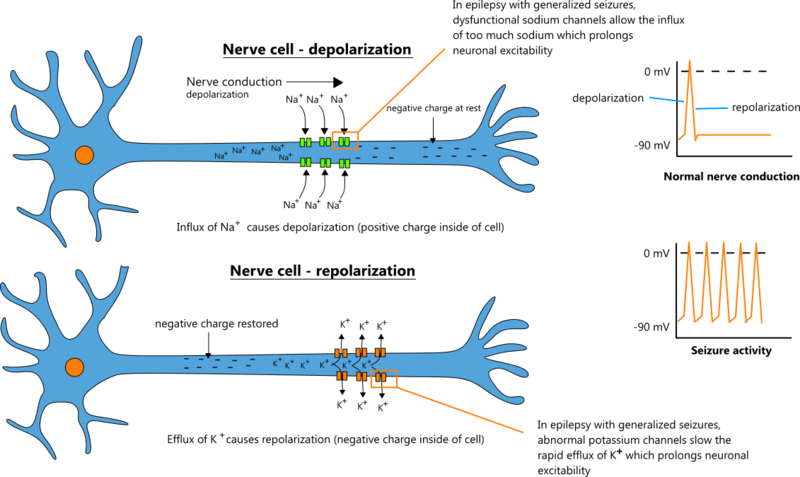 Sodium channels allow the influx of sodium which causes neuronal depolarization and the propagation of a nerve signal. Dysfunctional sodium channels allow too much sodium to enter the cell and greater depolarization occurs which increases the risk of repetitive bursts. Focal seizures originate in one part of the brain. Symptoms of focal seizures depend on the area of the brain affected. Focal seizures can also spread to involve both hemispheres of the brain in which case they resemble generalized seizures. Focal seizures may be motor or nonmotor. Motor symptoms are similar to what is seen in generalized seizures (e.g. tonic, clonic, myoclonic, atonic). If motor symptoms are present, they typically dominate. Mortality from status epilepticus in children is estimated to be < 3%. In adults, mortality can be as high as 30%. Most seizures last less than 5 minutes, and seizures lasting greater than 5 minutes are likely to be prolonged. Because of this, it is recommended that treatment for status epilepticus begin after a seizure has lasted more than 5 minutes. Starting treatment after 5 minutes may prevent the adverse outcomes associated with status epilepticus. Seizure symptoms depend on the seizure type. In many cases, the patient will have no memory of the event. Obtaining an accurate description of the event often depends on a witness account. Most seizures last less than 5 minutes. Important seizure symptoms and history elements are presented in the table below. Auras are actually focal seizures with awareness. If the focal seizure progresses to a generalized seizure, then the aura will precede the generalized seizure. In a typical EEG, 10 - 20 electrodes are placed across the scalp. Readings from electrodes are expressed as channels. A channel is the difference in voltage between a single electrode and a reference electrode. The reference electrode can vary depending on the type of EEG and may consist of a single electrode or the average voltage from a collection of electrodes. In seizure disorders, EEGs are obtained to look for abnormalities called interictal epileptiform discharges (IED). IEDs are sudden voltage changes that last milliseconds and are not part of the brain's normal background activity. IEDs are described morphologically as spikes, sharp waves, and spike-wave discharges. The AAN states that there is insufficient evidence to make a recommendation for or against routine blood glucose, electrolytes, and blood counts in patients with a first unprovoked seizure. It recommends that laboratory evaluations be made on an individual case basis. In some studies, screening for hypoglycemia and hyponatremia did have some diagnostic value. Seizure activity appears to alter hypothalamic inhibition of prolactin release causing elevated prolactin levels. Because of this, prolactin levels have been studied as a possible marker of seizure activity. The AAN issued recommendations for using prolactin levels in the diagnosis of seizure disorders in 2006. Important points from those recommendations are presented below. The cutoff for an elevated prolactin level in studies has typically been 2 X the baseline level. Levels > 36 ng/ml have also been used. Prolactin levels have a high specificity and low sensitivity. This means positive values are useful (low false-positives) but negative values are not (high false-negatives). Limb flailing is asynchronous. Pelvic thrusting is common. There is no loss of consciousness or motor symptoms. Recurrence is rare. The risk of side effects from seizure medications is 7 - 31%. Side effects are generally mild and reversible. Be aware of possible teratogenic effects of valproic acid. Lamotrigine may exacerbate myoclonic seizures. Carbamazepine and oxcarbazepine may exacerbate myoclonic and absence seizures. Use monotherapy when possible. If initial drug fails, monotherapy with another drug may be tried. Be aware of possible teratogenic and developmental effects of valproic acid. If there is a high risk of generalized tonic-clonic seizures, use valproic acid first. Be aware of possible teratogenic and developmental effects of valproic acid. Be aware of possible teratogenic and developmental effects of valproic acid. Carbamazepine and oxcarbazepine may exacerbate or unmask continuous spike and wave during slow sleep. Be aware of possible teratogenic and developmental effects of valproic acid. Topiramate has a less favorable side effect profile. Lamotrigine may exacerbate myoclonic seizures. Conversely, OCPs have been shown to reduce lamotrigine levels by as much as 50%, and they may also decrease valproic acid levels. When OCPs are combined with these antiepileptics, blood levels should be monitored closely. Lab monitoring raises the cost of treatment and requires increased patient compliance. These factors can affect drug choice. Most developed countries and regions have laws that govern driving privileges in patients with seizures/epilepsy. There are also laws that pertain to physician reporting of patient seizure disorders. In the U.S., the laws vary by state. The Epilepsy Foundation has created a webpage that details the laws for each state. The 2016 NICE Clinical Guidelines makes several recommendations for stopping therapy. It also provides a table that can help predict the future risk of seizures based on a patient's response to initial therapy, seizure type, length of time since last seizure, and recent EEG results. A ketogenic diet is a diet that is low in carbohydrates and high in fat. With only a small amount of carbohydrates available for energy utilization, cellular metabolism is forced to shift from glycolysis to fatty acid oxidation. A byproduct of fatty acid oxidation is ketone bodies, hence the name "ketogenic diet." In general, a ketogenic diet may be tried for any refractory seizure type in children. Most neurologist will recommend a ketogenic diet after failure of 2 antiepileptic medications. In trials, ketogenic diets have generally been found to be effective, although most trials were unblinded. Based on findings from meta-analyses, a ketogenic diet will reduce seizures by > 50% in half of patients and by > 90% in a third of patients. Some seizure types appear to be more responsive than others. The table below lists seizure types that have been found to be particularly responsive to a ketogenic diet. Patients with these disorders may want to try a ketogenic diet sooner than patients with other disorders. In a review that analyzed trials in adults and adolescents with refractory seizures, 43% of patients achieved ≥ 50% seizure reduction on a ketogenic diet. Of the 43% who responded, 12% became seizure free. The trials were limited by small sample size and lack of intention-to-treat analysis. The ketogenic diet is contraindicated in patients who have disorders of fatty acid transport and oxidation. It is also contraindicated in patients with porphyria. Disorders of fatty acid transport and oxidation include carnitine deficiency, carnitine palmitoyltransferase (CPT) I or II deficiency, carnitine translocase deficiency, β-oxidation defects, and pyruvate carboxylase deficiency. There are several different types of ketogenic diets that may be instituted. A brief synopsis of each diet is presented below. MCTs are more ketogenic than long-chain fatty acids. This allows for a lower proportion of fat (30 - 60%) and more protein and carbohydrates. Carbohydrates are initiated at 10 grams a day and gradually increased to 15 - 20 grams/day. Fat and protein are not restricted. Patients may consume 40 - 60 grams/day of carbohydrates that have a glycemic index of < 50. Of the remaining calories, 60% should come from fats and 20 - 30% from protein. Neurocysticercosis is an infection of the brain caused by the tapeworm Taenia solium. It is the most common cause of preventable epilepsy in developing nations with an estimated 2 million people worldwide having epilepsy caused by T solium. The ideal treatment for neurocysticercosis has not been fully elucidated. In 2013, the American Academy of Neurology (AAN) published evidence-based guidelines for the treatment of neurocysticercosis. Important points from those recommendations are presented below.